The above houses which are designed for domestic and commercial use are manufactured in planed, tongued and grooved timber on exceptionally strong framing. Fitted with sliding and wire door. Treated externally with creoseal. Roof t & g boards covered with green mineral 35kg roofing felt (optional Hyparoof polyester felt available). These houses are mounted on 125mm x 75mm (5in x 3in) skids, so can be easily moved. Four, five or more windows provided at front and two at back (depending on size of house) are provided with 6mm (1/4mm) stipplyte glass. Internal Communal nest box internally along the front, also there are dropping boards and perches running the full length of the house. 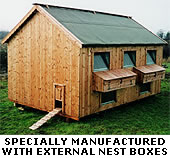 However external nest boxes can be quoted for. These houses are complete in sections, prices include free delivery and assembly to most areas. Contact our Office on the phone number below for more details.